Available for download, FabFilter Pro-Q 3 represents the third iteration of the company's well-regarded equalizer. Many features remain true to the version 2. The familiar and intuitive GUI with 24 clickable bands hasn't been changed, for example. However, Pro-Q 3 offers new features, such as streamlined EQ-matching with other instances of Pro-Q 3, per-band M/S or L/R stereo processing, support for surround sound up to 7.1.2, and a new Dynamic EQ mode. Dynamic EQ can be implemented on any bell or shelf filter. You can use this mode to compress or expand a frequency band based on the strength of the incoming signal, much like a multiband compressor. Attack and release are handled under the hood. You're given an intuitive range control to handle the degree of dynamics-processing, though the threshold can be set manually if need be. With dynamic mode, you can use the Pro-Q 3, a de-esser, while EQ'ing the rest of the signal in a more traditional fashion. Pro-Q 2 provided EQ matching via the sidechain input. Pro-Q 3, however, takes EQ-matching a step further: now you can choose any other instance of Pro-Q 3 in your mix and compare it to the source audio instantaneously. You'll also note that the plug-in shades any possible conflicts in a reddish hue. This helps you identify where, for example, a kick and a bass might be competing for the same slice of the frequency spectrum. Stereo functionality has also been updated. In previous iterations, you could tweak the left and right channels independently, or switch the whole plug-in into mid/side mode for M/S processing. In Pro-Q 3, this option has been implemented on a per-band basis. 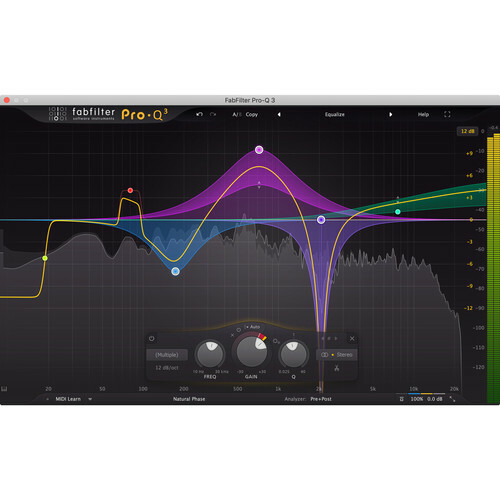 This is particularly useful for mastering engineers, as they no longer need to load multiple instances of the plug-in for left/right or mid/side processing. If you need to filter the lows out of the sides, notch out some resonance from the middle, and attenuate a harsh crash cymbal on the left of a mix, you can do that all in one instance of the plug-in. This per-band processing extends beyond stereo implementations into surround sound applications up to 7.1.2 (Dolby Atmos). You can select individual channels or grab selectable groups, all on a per-band basis. Some aspects of previous versions have been improved, such as the Spectrum Analyzer, the Spectrum Grab function, MIDI learn, and the filter shapes themselves. Other features, such as selectable display ranges, intelligent solo mode, adjustable linear phase latency modes, zero latency and natural phase modes, and the polarity inversion selector have been left alone. The plug-in is compatible with Mac and Windows. It can operate in AU, VST, AudioSuite, and AAX formats. Note: This pricing is available to customers who have previously purchased FabFilter Pro-Q 1 or Pro-Q 2, and who would like to upgrade.